HONAUNAU —Walter Wong stood in front of the calm waters at Honaunau early Saturday morning, with a small gathering of people encircled behind him, to offer a prayer. 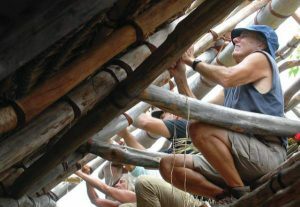 Keoua Honaunau Canoe Club has hosted hale building workshops for the past few months as the group works to restore a structure across from the boat launch originally built as the school, Hale o Hooponopono, in the early 1970s. Saturday was the final day in the workshop series. 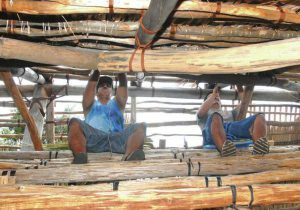 Volunteers thatched lolu leaves to ohia logs by ground as well as perched in the scaffolding. Built with donated ohia, the hale is 20 by 40 feet. The original building was 20 by 36 feet. 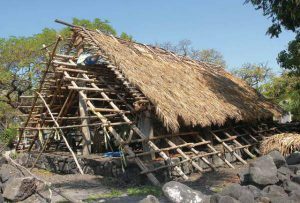 With the assistance of Wong, member of Halau Hale Kuhikuhi, canoe club and community members have been able to restore the structure. School children have also donated time to its restoration. Ramirez said the hale is built traditionally with the exception of nylon cord and concrete to bring the structure up to fire code. Sprinkler heads have also been installed. The hale, Ramirez added, is probably the most solid hale structure on the island. “It’s very calming to work with your hands and put your mana into it,” Ramirez said. Once completed, Ramirez said, it will be an educational center — a sacred spot for learning and ceremony. 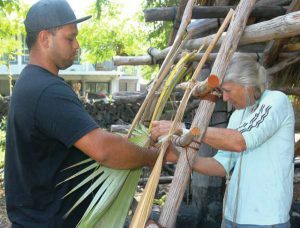 “To make things pono with upbringing of children, be pono with the aina and have respect of land and culture,” Wong said. 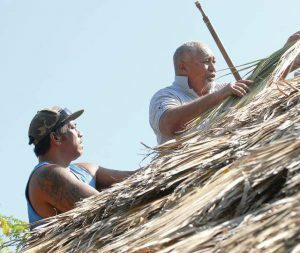 Emely Wilson, 56, Honaunau resident, assisted with thatching on Saturday. Although she doesn’t paddle in the canoe club, she pays dues to the club and participates in events as a member of the community. She said she wanted to be part of the restoration project because it’s in her community. “We’ve built everything from the ground up,” Wilson said. The Honaunau woman has been involved from the beginning. She has also spent time thatching on days not designated for workshop. “I’m hoping it’s going to do what it’s supposed to do and keep kids out of trouble,” Wilson said. Before the hale restoration started, Ramirez said, he knew it was a labor intensive project and would take more than just community donations. The club applied for a grant with the Administration of Native Americans. They were turned down for three years until the group was awarded $350,000 in 2016. The money received will also go toward ahupuaa, or boundary markers in the community. The hale should be complete in May with a dedication to be scheduled in June. The banner image above is an early 1900s archival photo of the shoreline area of Hōnaunau Bay that encompasses Kapuwai and part of what is now the Puʻuhonua O Hōnaunau National Historic Park. Look closely to see the Model T coming down the road, the fishing canoes, and the “Kona Nightingale” (donkey) walking along the beach. From 2015–2017, Keōua Hōnaunau Canoe Club implemented a grant-funded project to strengthen the cultural landscape of this coastal area. Together with many community members and project partners, we restored the Hale O Ho‘oponopono at Honaunau Bay and created an educational ahupua‘a boundary marker system for the area. Do you have stories, photos, or other information that you would like to add to our collection of historical, genealogical or other information about Hōnaunau Bay? Please provide your name and email address and/or phone number and weʻll get in touch with you.